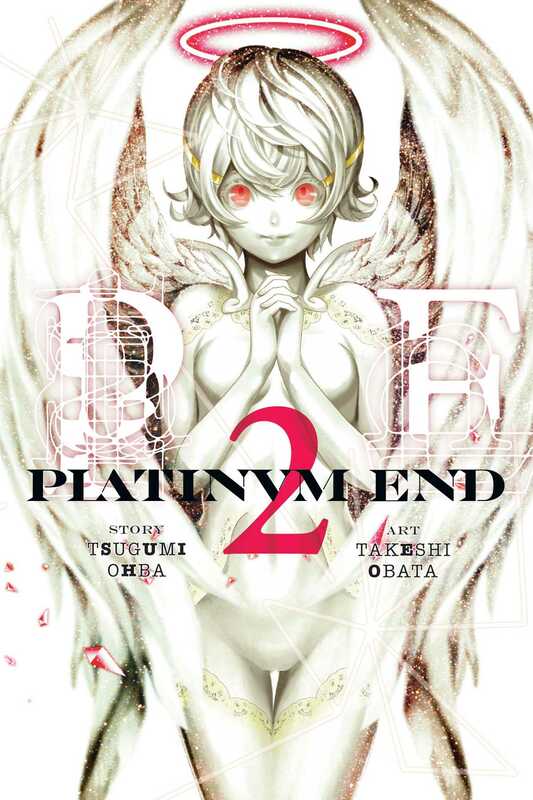 Platinum End volume 2 was written by Tsugumi Ohba and illustrated by Takeshi Obata. This volume was published on 7th of March, 2017. This volume features the second three chapters (04-06), read the review for the first volume here. The first chapter starts right where the previous volume ended and Saki Hanakago has just pierced Mirai (the protagonist) with her red arrow, causing him to fall in love with her. Little does she know that Mirai already loved her, she only released his emotions. Now without a home, Mirai takes to living with Saki; as her save for the first 33 days, and as her ally after. While all this is going on Meteo Policeman puts his plan into action, a plan to wipe out as many God candidates as possible with one bold move, and thus he airs his challenge to the world on live television. My Review: The volume starts off rather slow but quickly picks up the pace when Metro Policeman starts causing a mess. Around the start of chapter 4 is when things start to get really interesting, as each Metro (Blue, Yellow, Green and Pink) enter the fight we start to get a sense of tension involved in the God game, despite how ridiculous it may seem. We also start to see some alliances popping up (if only for a briefly), in fact, the volume ends with the introduction a character that I assume will be joining the main duo. I am starting to get the sense of scale involved with this world, however, I do think that Metro Policeman is killing all the other candidates in quite rapidly. If this keeps up then I would think we would run out of character. While I’m on the topic of characters, I would like to discuss how three of the characters introduced are killed shortly after. I know that we want to get on with the action, but I would have preferred more than just a few panels we had to develop the characters. It would have made their deathes more impactful. Never the less, Volume 2 finishes with another cliffhanger, enticing we to read on, rest assured I will continue reviewing this series as I get my hands on the books. I rate this manga 6.5/10.